Okay, Mineshot 1.5 should now support Minecraft 1.7.2 and Forge 10.12 build 1013+. It's a somewhat experimental build with lots of changes under the hood, just like about anything for 1.7 right now. So yeah, happy testing. Quote my post if you want me to see your reply! I can't seem to get the experimental version working. I installed it 3 different ways and none of them work. Well, both .jar files in the mods folder is correct, but it's weird that only ProfilerEvents shows up. Maybe check the log for errors. I searched latest.log for "Mineshot" and found 2 instances. 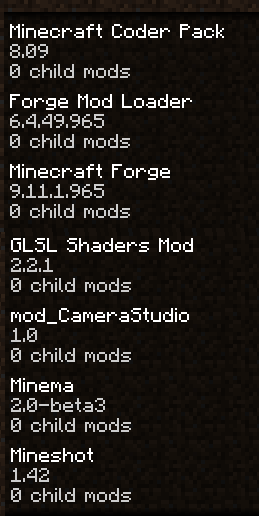 [Client thread/INFO]: FML has found a non-mod file Mineshot-1.5.jar in your mods directory. It will now be injected into your classpath. This could severe stability issues, it should be removed if possible. Looks like your Mineshot-1.5.jar is corrupt for some reason, maybe try to re-download the package. I tried redownloading and I did nothing, I checked the checksums and they're the same. Well, then I'm out of ideas. The very same files work fine for me. What Forge build do you use? What Forge build do you use? Alright I just tried it with forge version 10.12.0.1019 and it works fine. Tiling finally works with Acid Shaders. I see, so it looks like older Forge builds really don't work. And yeah, Minema is the next step. I always wanted to use FBOs for video capturing, since they work very well with shaders and can be captured asynchronously, which would improve the capture performance. But I probably won't start porting Minema as long as Forge doesn't have a recommended build for 1.7, so that could take another while. Ah I see. That'll give me time to figure out what I'm gonna do in regard to the terrain. All the legacy terrain mods are dead I'll probably force all biomes to look like a beta forest. Sorry if I missed the announcement, but is the orthographic mode disabled in 1.7? Nope, only in multiplayer as usual. OK everything seems to work fine after a reboot of my laptop.... getting the tiled screenshots now but i reckon to upgrade my forge. 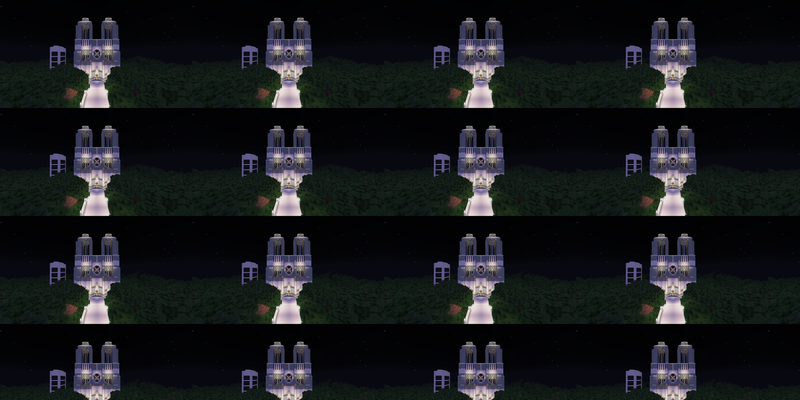 New edit: got the latest forge (965) for minecraft 1.6.4 but i get the tiled screenshot ;( any solution for this? as i really do not want to upgrade yet to 1.7.2 or higher due to bucket being wonkey on my server and such. I'm trying in a singleplayer world. No dice. It's not even an option in the Shift+F9 area . EDIT: I'm a noob. I forgot how to use this mod :P. Thanks for the update! Nope, older versions support tiled rendering only. Minecraft 1.6 also doesn't have a build-in FBO. so this is normal in older versions? No, not really. Looks like the camera settings can't be applied correctly. Do you have any other mods installed? What would you recommend? 100% clean installment? i can just wipe it all from the drive and redo every thing? i am a little confused with the new launcher still and all the profiles! or would be taking away all the mods and make a new profile start the game then close it and install the mods again be sufficient? Well, that combination should work, actually. I think I'll try out your mods installation and see if I can figure out the problem.